ExhaustCLEAN provides commercial kitchen exhaust system maintenance solutions to the food service industry and institutional facilities in the Research Triangle and Triad regions of North Carolina, covering Raleigh, Durham, Chapel Hill, Cary, Morrisville, Greensboro, Winston-Salem, High Point, Burlington and surrounding communities. our customers through our Services and our Process. 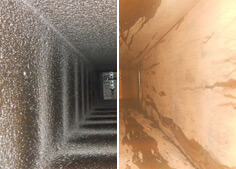 Do You Really Know What Condition Your Kitchen Exhaust System Is In? ExhaustCLEAN provides commercial kitchen exhaust system maintenance solutions to the food service industry and institutional facilities. Our professional cleaning services maintain safety and compliance with the National Fire Protection Association Standard (NFPA 96) and its provisions for commercial kitchen exhaust system maintenance and cleaning. We take an educational approach to teach you about your kitchen exhaust system, showing you the possibly alarming extent of grease accumulation and threatening fire hazards. Then we thoroughly clean your system to like-new condition and ensure its safety through ongoing maintenance. Contact us to schedule your no-cost ExposureAUDIT or to learn more about ExhaustCLEAN and our exhaust system maintenance solutions. In my 40-plus years in the restaurant business, I have never had a hood cleaning company as professional, punctual and thorough as ExhaustCLEAN. By doing more complete cleaning, we don’t have to clean so frequently, saving money and getting better results. I never worry about problems with my hood system. I receive before and after photos showing the perfect finished job. ExhaustCLEAN is simply the best. ExhaustCLEAN provides comprehensive kitchen exhaust cleaning and maintenance solutions to restaurants and other commercial facilities in Raleigh, Durham, Chapel Hill, Cary, Morrisville, Greensboro, Winston-Salem, High Point, Burlington and surrounding communities in North Carolina. ©2013 ExhaustCLEAN. All Rights Reserved.